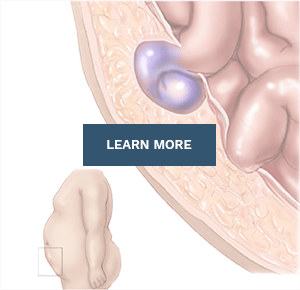 Hernia types are categorized based on where the they are located on the body. As discussed below, types of hernias are also labeled based on other identifying factors. 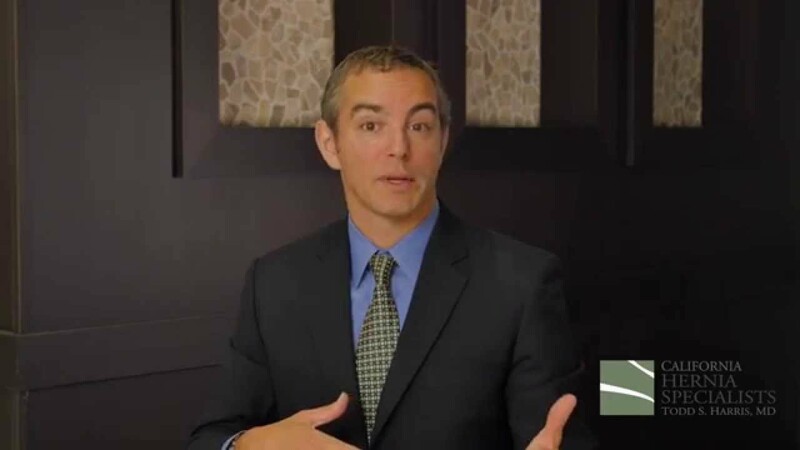 Each hernia is treated differently based on it’s location and other factors. As expected, no one treatment is right for a specific hernia or a specific patient. Understanding the different types of hernias can help you be more educated in making decisions about your treatment. 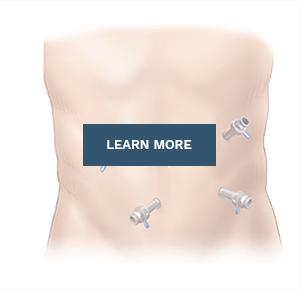 The location of a hernia is the primary way it is categorized (click a hernia below to learn more). Hernia types are first categorized based on where they are located on the body. Inguinal hernias, also known as groin hernias, are when the intestines or fat push through the muscles into the inguinal canal (groin area). This is by far the most common type of hernia, comprising about 75% of all abdominal wall hernias. Inguinal hernias can be found in men and women, but are much more common in men due to the fact that men already have a small hole in the groin muscles to allow the arteries, veins, and spermatic cord to pass to the testicles. 97% of inguinal hernias are seen in men. The hernia can be directly through the muscle (direct inguinal hernia) or the hernia can follow the round ligament or spermatic cord through it’s indirect path as they exit the abdomen (indirect inguinal hernia). Distinguishing between a direct and indirect inguinal hernia is difficult, if not impossible before surgery. Fortunately, it is also unimportant since the treatment, including the incision and the repair itself, is essentially the same for either one. Inguinal hernias often develop as small bulge that enlarges over time. Again, the bulge that is seen is often internal fat or intestine pushing through the muscle. The bulge may disappear while lying down and return with activity. As a groin hernia gets larger, the bulge can often extend from the groin down into the scrotum itself. These larger hernias can be difficult to reduce, causing more symptoms. You can read more on our ‘Inguinal Hernia‘ page. Umbilical hernias develop at the ‘belly button’ and often are diagnosed because of a small bulge. 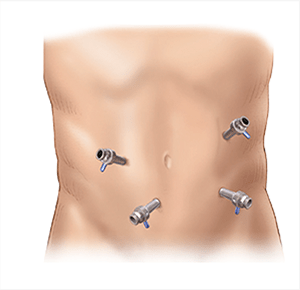 Belly button hernias, known as an umbilical hernias, are when the intestines or fat push through a weakening of the muscles in the middle of the abdomen underneath the umbilicus or navel. This location is prone to muscle weakness since it’s where the greatest stress is placed on the muscles when we do anything physical. In children these hernia often go away on their own, but in adults these hernias never get better and usually get larger over time. 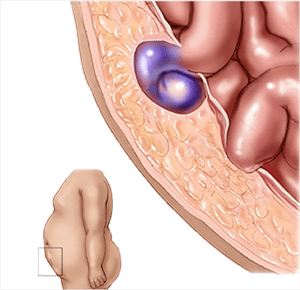 You can read more on our ‘Umbilical Hernia‘ page. As we’ve discussed elsewhere on our site, hernias form due to a weakness in the muscles of the abdominal wall. Whether that is located in the groin, the umbilicus, or a prior incision, the cause of a hernia is almost always the same – weakened muscles. The treatment for a hernia is to repair this weakened muscles, and close the hole that has formed. As you can imagine, sometimes this weakened muscle is extensive, and a very large hole can form. Repairing the hernia always comes with a small risk that the hole can form again after surgery, which is then called a recurrent hernia. Sometimes this recurrent hernia pushes through the same hole that was initially repaired, while other times it pushes through the weak muscle adjacent to the initial hernia. Fortunately, there are always surgery options that can be used to treat recurrent hernias. This includes laparoscopic hernia repair, or the use of newer meshes. 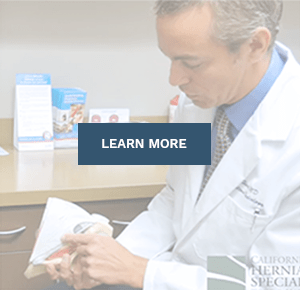 Although every surgeon tries to repair the muscles around a hernia as best as possible, there are always times that due to the weakened muscles, the hernia returns. You can read more on our ‘Recurrent Hernia‘ page. Incisional hernias are used to describe a hernia that protrudes through an older surgery incision. Whenever patients require an incision for surgery, the muscles have to be sewn back together. No matter how these muscles are sewn together, they are never as strong as before the original surgery. Over time, the muscles can pull apart creating an incisional hernia. This can happen at the location of any prior surgery. Sports hernias are difficult to diagnose and difficult to describe. A typical sports hernia is when the muscles which converge and join in the groin area and at the pubic bone tear, causing pain in the groin region. The pain is worse with activity such as sitting up and pulling the legs into the body. This aggravates the tear in the muscle causing pain. A sports hernia differs from all the other hernias in that there is not usually any fat or intestine pushing through the torn muscle. The tear itself is what causes the pain. Although these hernias are often found in athletes, they can also be found in regular individuals without an athletic background. You can read more on our ‘Sports Hernia‘ page. These types of hernias are similar to all other hernias in that they form due to weakening of the abdominal muscles. These hernias are located between the belly button or navel, and the lower part of the breast bone. Repair of these hernias is very common and can be done with open surgery or laparoscopic surgery techniques. You can read more on our ‘Ventral Hernia‘ page. Femoral hernias are a slight variation on inguinal or groin hernias. In an inguinal hernia the hole that forms in the muscle is located just above the ‘inguinal ligament’ (see our ‘Hernia Anatomy‘ page). In a femoral hernia, the hole in the muscle is just under the inguinal ligament in the femoral space. The femoral region lies just below the groin. The area includes the femoral artery and vein, as well as the ‘femoral space’. This space lies just under the inguinal canal or the groin crease. Occasionally fat can push under the groin into the upper thigh. This is more common in women. Again, this variation is of limited importance since the surgery, including the incision and the repair are essentially the same. Women get femoral hernias much more common than men, accounting for over 97% of all femoral hernias. However, an inguinal hernia is still more common, even in women. Unilateral is the medical way of saying “on one side” of the body. Most patients only have one hernia which is ‘unilateral’. However, some patients may have hernias in both groins, which would be described as ‘bilateral’.